running socks provide comfort, cushioning and breathability during your workouts. Among the various online models also compression running socks and trail running socks. Whether you are a professional runner or have started running for a short time, it is important to carefully choose the running socks to match your running shoes to take full advantage of both of them and to ensure maximum comfort. Choosing technical running socks rather than generic socks has the advantage of reducing the risk of blisters, of better managing the sweat of the feet and slipping into the shoe. The racing socks must be, first of all, seamless and soft, as well as having an anatomical footbed that gives stability and does not tighten on the ankle. All models of the best brands that you find online on Mister Running, are designed to keep your feet cool and dry and to ensure maximum thermal insulation thanks to the ventilation channels. Discover the vast offer of megastore running socks! Trail, running or compression: a choice of endless socks! The choice of the right pair of running socks should be done taking into consideration several factors, including the terrain of practice of your training. Some socks in fact allow a more comfortable maintenance on difficult terrain such as trail. Thanks to better support, greater protection, proper grip and proper ankle maintenance, trail running socks prevent the risk of distortion during your mountain outings. On the other hand, if you train on the asphalt of the city, you have to opt for softer, lighter models with quick and effective breathability: running socks are recommended because they are more comfortable and protective during practice. 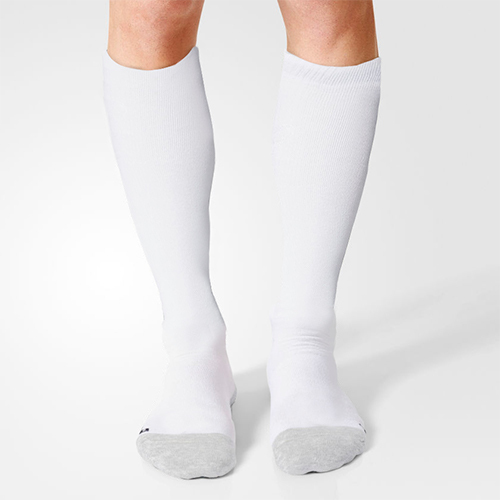 But that's not all, in our online store you'll also find a wide selection of compression socks. Those with traffic problems seem not to be able to do without them! These are socks that reduce the feeling of tiredness, allowing more intensive training to reach new goals. How about trying them too? Buy your new running socks on Mister Running, you will not regret it! There are over 200 racing socks of the best brands always available online on Mister Running. All the models are already in stock and ready to reach you at home in 3-4 working days throughout Europe. And if you're not convinced of your new running socks you have 14 days to take advantage of free returns. One of our courier will collect your package directly to your address and the refund will be made in a very short time.